Pizza night! Ok usually we save our pizza delivery night for Friday but I had to share this one for Meatless Monday so you had all week to think about making it. One of my families favorite nights is homemade pizza night! I’ve mentioned it before and I’ve posted many pizza pictures on social media. I was never a huge pizza fan like many people I know until I fell in love with Neapolitan Pizza. I also started really liking it more when we started having our own homemade pizza nights so we could all have it our way so everyone was happy and there wasn’t any arguing. It also helped that it wasn’t a big greasy mess. When my husband perfected making the Neapolitan Pizza Crust at home I started requesting homemade pizza night more often!! If you ask our friends pizza nights can get really crazy around here. Not so much when we just do them with our family but when we have people over and the whole island in the kitchen, all the counters, and the kitchen table covered with pizzas being made and are making 16, or sometimes more, pizzas it’s crazy. It goes for hours and everyone leaves full, plus a to go box. Oh but then there is also the toppings, we don’t have just your average toppings, anything goes! Yep I posted about 3 years ago one of our pizza parties, A has her favorite mac n cheese pizza, but lately goes for a very minimalist approach of olives, peppers sometimes, and a tiny little bit of cheese that doesn’t even touch half the pizza. My husband makes some pretty crazy everything pizzas and even has some breakfast pizzas he adds eggs to. He really likes pizza night on New Years Eve with all the leftovers, like the cheese from the cheese platter, he gets to play with on his pizzas. Me well I stick to the “Punch Pizza Mimi” which is basically cook the crust with a little evoo, lots of salt, and sometimes I add roasted garlic blended with my evoo. After the crust is baked I add on my tomatoes, fresh mozzarella, and fresh basil. Oh and lots of extra virgin olive oil and balsamic on the side! Even the girls are with me on that, we went to Punch Pizza twice Mother’s Day weekend because my hubby was away for work and we got our dip on with that evoo and balsamic, a good dose of healthy fat. Than I also have my crazy ones where I add peanut butter, make a pad thai, rosemary potato, add sweet potato, crazy veggies, beets, the list goes on but depends on my mood. 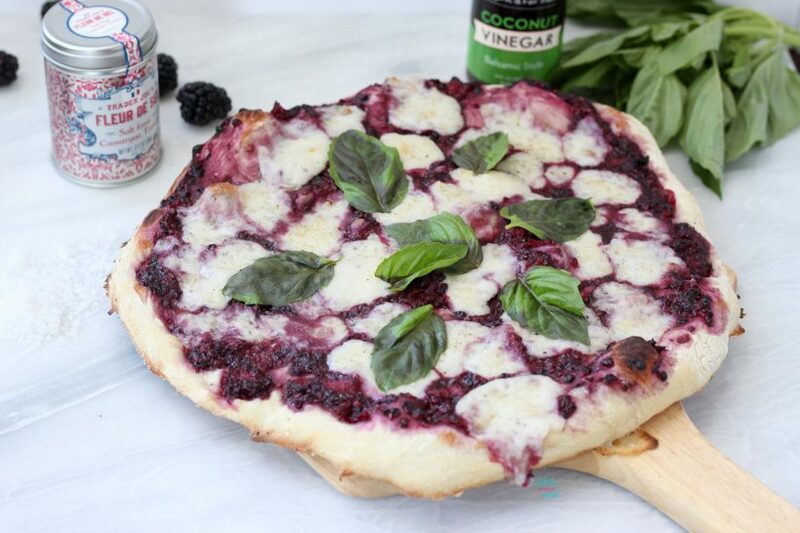 Since it’s spring and things need to be freshened up a little big a week ago I whipped up a Blackberry Basil Pizza on pizza night and it did not disappoint! 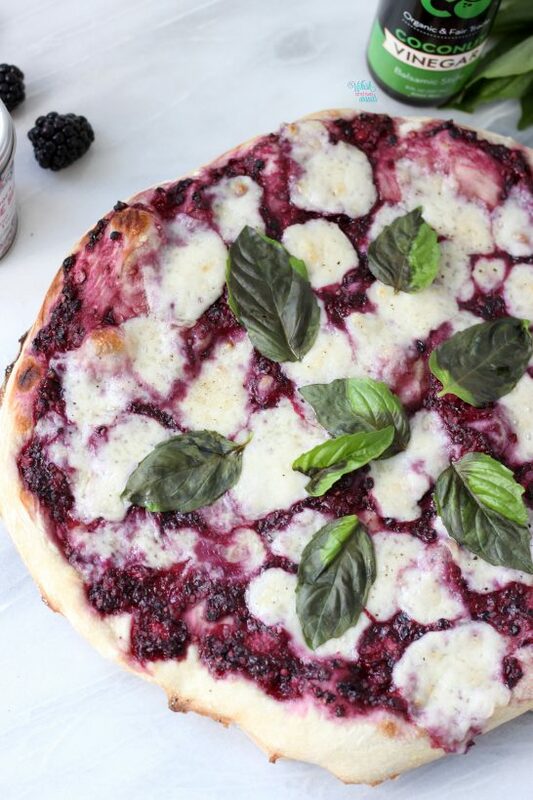 I know what you’re probably thinking, but blackberries really aren’t that sweet and they pair perfectly with fresh mozzarella (I used a dairy free vegan one) and basil. Perfectly salted and having balsamic on the side it’s delicious! Oh and guess what, it is so good cold for breakfast the next morning so be sure to save a slice and hide it in the fridge. 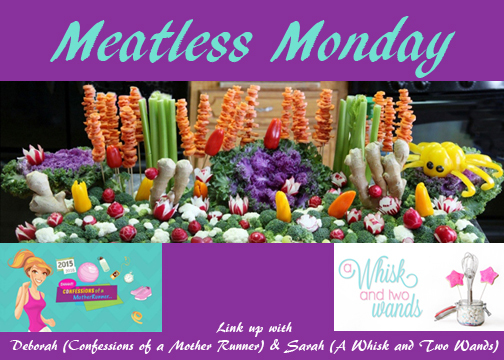 Don’t forget to link up with Deborah and me for Meatless Monday below! Heat grill, with pizza stone placed inside, to 550F if using my husband’s crust recipe otherwise heat per your pizza crust directions. 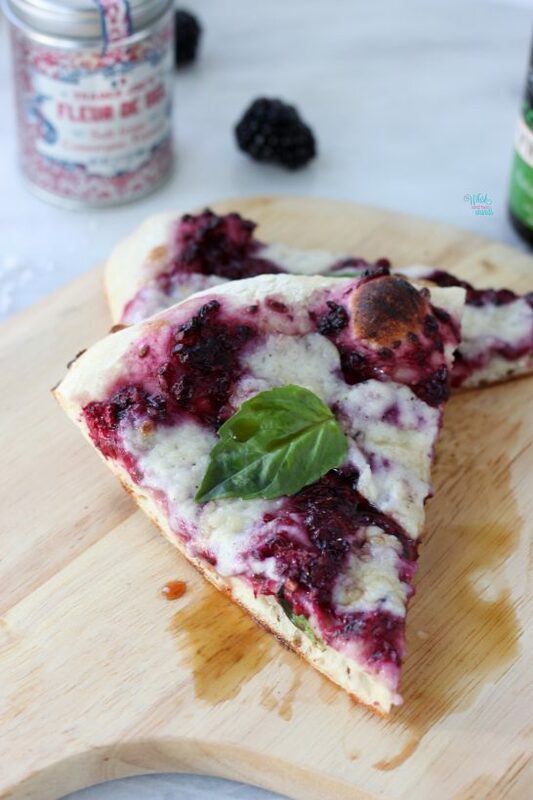 In a small bowl mash the black berries with a fork until you have the a sauce like texture. It won’t be smooth but the berries will be mashed. Spread the mixture on the pizza crust as you would a pizza sauce. Next take your mozzarella and sprinkle pieces, chunks over top. Season with sea salt and pepper. Place pizza, keeping it on the parchment as it will easily slide on and off your pizza stone, onto the pizza stone. 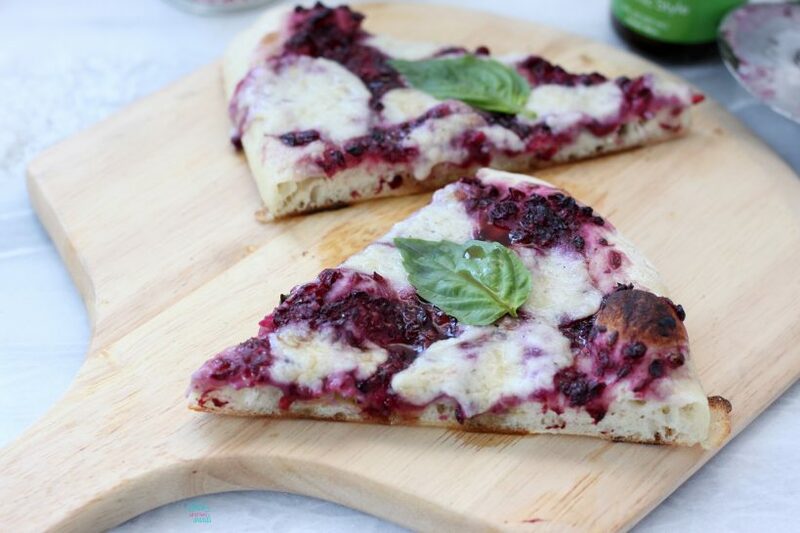 Check at 5 minutes but depending on the heat you are able to maintain it may take up to 8 minutes, the crust should start to be golden brown and slightly blackened on the outer edges like a traditional Neapolitan pizza. If using your own crust bake per your crusts instructions. 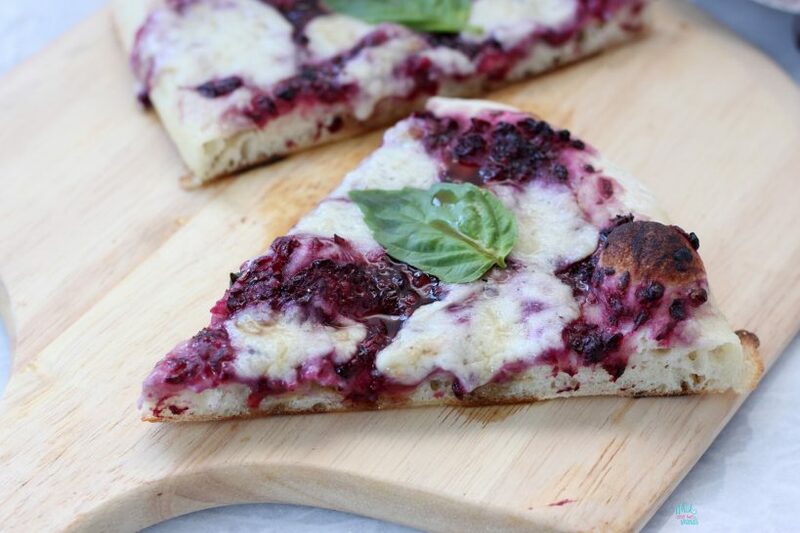 Remove pizza, sliding a baking sheet under the parchment paper. Top with fresh basil and serve with balsamic vinegar. Enjoy! **For gluten free we’ve found Cup 4 Cup Flour works best but it does have milk powder. I have never had issues with it. I haven’t tried it with the Cup 4 Cup without the powder but will in the future and report back. Using a KitchenAid or similar stand mixer with a dough hook option, add water to mixing bowl then add flour. Create a small bowl-like area in the flour and add the salt and yeast to the recessed area. Start the mixer on the lowest speed to incorporate the ingredients then increase the speed to the highest setting allowed for your dough hook (normally a low setting-2 for our KitchenAid). Mix for about 5 minutes scraping the sides down as needed until the dough is uniform and consistent in texture. Cover mixing bowl with plastic wrap or scrape into a different air-tight container if making more than one batch (ice cream pails work well). Place in a warm location and let rise for about 4 hours or until doubled or more in size. Turn dough onto a well floured surface, dust top of dough and hands liberally with flour, need dough into a ball, then divide into 4 equal pieces. Shape into a 10-12″ circle and place on a parchment paper lined baking sheet. Also linking up with The Fit Foodie Mama and Running on Happy spreading the Meatless Monday love!! Thank you Rebecca! They are all over here and A loves them! What a fantastic, unique and delicious looking pizza! Love that flavor combo! Thank you Annmarie! 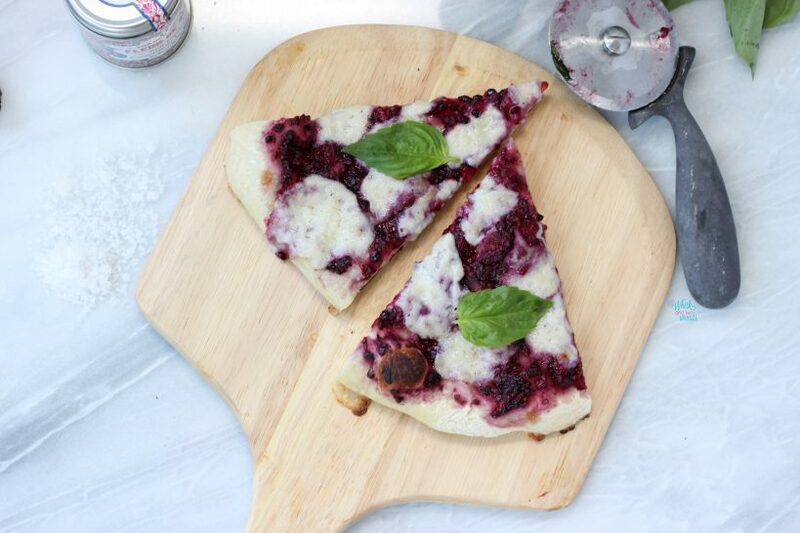 It’s a fun and flavorful way to freshen up pizza night! Happy Meatless Monday! Think of it like a salad and how it balances out with the savory and not too sweet. It’s so delicious I wish I could have you over for pizza night! Happy Meatless Monday! This looks outstanding, Sarah! I want to come to pizza night at your house, it sounds so fun! Thank you Sarah! Anytime you just let me know when! I’ve said it before and I’ll say it again – You are a genius! This looks amazing! Aww thank you Nicole, I needed this today! I hope you have a great week! 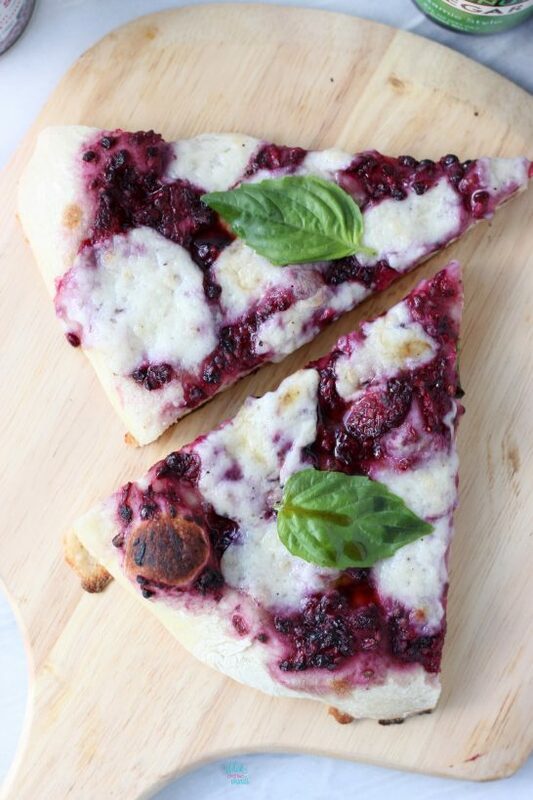 I’ve never really thought about making a fruity pizza but this looks amazing. I’m going to put it on my “to-make” list! I’m still dying to try the Miyoko’s Creamery Fresh VeganMozz but haven’t seen it in my whole foods yet! It’s a fresh and flavorful combo I hope you love it! Think of it like you would when you pair things in a salad, the sweet and savory. I hope your Whole Foods get the Miyoko’s Fresh Mozz soon, it’s so good! We haven’t tried all of them but so far it’s the only one we love, so much so we’ve been buying it weekly! Oh yum!! Pizza night at your house sounds fabulous!!! Thank you Lauren! It’s always fun and flavorful! So pretty– and what a great flavor combination, too! This looks so pretty. Again. You and your beautiful works of culinary art! 🙂 Love it. Thank you for your kind words Rachel! This is the most unique pizza I’ve ever seen, and it’s beautiful! I love this idea! ANd yes to blackberries! 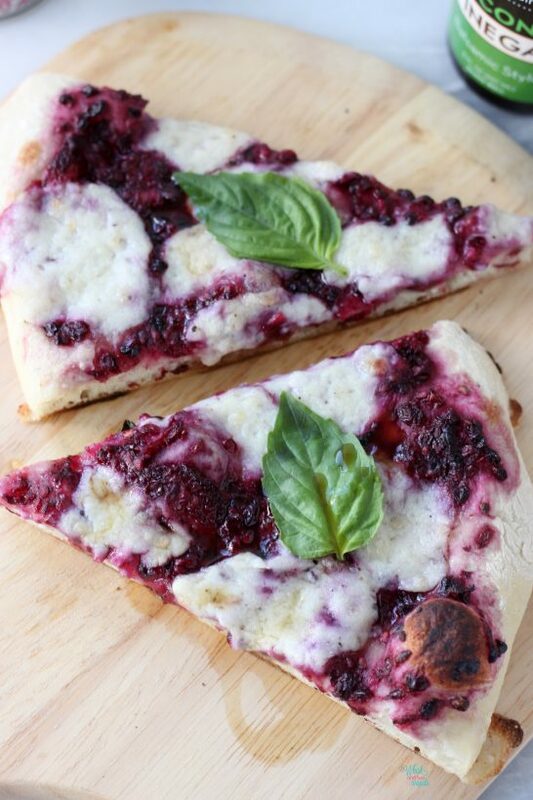 Balsamic Basil Blackberry Pizza – Bon Appetit Baby!